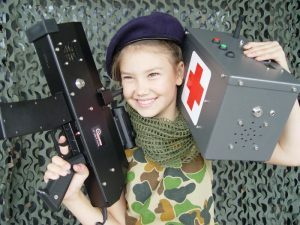 How cool: a laser tag party that comes to you! Seriously… HOW COOL?? This is a super fun and unique party pack that simply never disappoints! Our professional and fun-loving host (or hosts) will bring EVERYTHING to your door, set up the battlefield and get the kids completing ‘missions’ with lots of running, hiding and shooting for 1 to 2 hours! Our Laser Tag party is designed for kids aged 7-15… but lets be honest, parents will want to get involved too and that is fine! At home, a school oval or hired venue- it’s up to you! You can have it indoors or outdoors, but the more space the better (we do need a minimum of a 10 x 10m space to get ourselves all set up). The space doesn’t even need to be wide open: our fun laser tag hosts can incorporate trees, cubby houses or other existing structures into the battlefield to make the day even more fun! This awesome party is suitable for groups big and small. Please call our Party Planning team on 1800 572 789 for a recommendation and quote on the best pack for your expected guests!